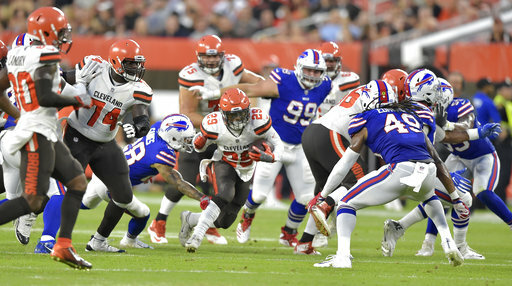 The Bills evened their preseason record at 1-1 following their 19-17 win over the Cleveland Browns in Cleveland Friday night. Like most preseason games, the play was sloppy but there were some things worth mentioning on both the positive and negative side. A.J. McCarron got the start last night and struggled before leaving the game with a reported hairline fracture of his right collarbone. While McCarron did not look good, much of the blame can go to the starting offensive line who also had a rough time. McCarron got little protection and had to hurry throws. The passing game was also hurt by the lack of any ground game early on. This kept the Bills totally off-schedule when it came to down and distance. Rookie Josh Allen followed McCarron and showed much improvement over last week versus Carolina. He was more decisive with his reads and decision making and showed good accuracy. For the night, Allen completed 9 of 13 throws for 60 yards and a touchdown. He led the Bills to 10 straight points late in the first half to give the Bills a 10-7 lead at halftime. The other thing that jumped out at me was Allen moved around in the pocket well, was able to avoid pass rushers and stepped up to make throws. These are the type of week to week improvements the Bills coaching staff are looking for. Nate Peterman played the last third of the game and like last week was very steady. He completed 8 of 10 throws for 113 yards and a touchdown. In the first two preseason games, Peterman has easily been the Bills steadiest and most productive quarterback. With McCarron injured, what do the Bills do? First off, a final determination has to be made as to the extent of the injury. Regardless, I think the earliest that McCarron will be back is probably in four weeks. If he has a compete break of the collar bone then it could be even longer. Even if McCarron is only going to miss a month, the Bills will most likely try and sign a quarterback to at least help get them through camp. There is not a lot out there but I would think that if there is a veteran who is familiar with Brian Daboll’s system that will be the guy the Bills look at. Daboll’s system and terminology is similar to New England’s system. It’s imperative for the Bills to at least get someone in so that they learn and understand the system in case there is another injury at the position. The injury to McCarron also means that the opening day starter will be either Peterman or Allen. My guess is the coaching staff will go with Peterman as he gives the Bills the best chance to win early on. Remember, this year is supposed to be about the development of Allen and having him play before he is ready can be counter-productive. Whoever gets the start next week will most likely be the game one starter. I watched Edmunds closely last night and though the stat sheet said he was productive with four total tackles in just over a quarter of play, there are things he needs to improve on. Right now, Edmunds is reacting more than anticipating and that is causing him to be a step late getting to the ball. He is also being fooled by misdirection at times. This is normal for a rookie and as he gains experience and feels more comfortable within the system he will improve. There were plays in which he was making the right read but was over-pursuing a little. In the NFL that little bit of over-pursuit can make the difference between making a play at the line of scrimmage of not making the play at all. I felt Edmunds long pursuit was good as he consistently took good angles to the ball. He was also good in coverage, showing he can play both man and zone and keep things in front of him. With two more preseason games, the Bills have to hope that he begins to anticipate more quickly. Kevin Sylvester’s thoughts on the Bills-Browns game.